For my US friends, it’s almost Thanksgiving time! 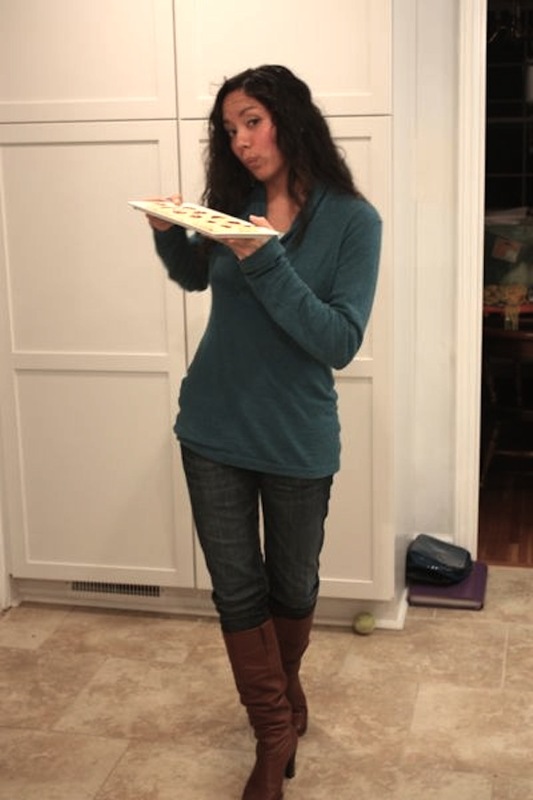 I have a fun new cookie recipe to share with you guys, but first…today’s eats. I haven’t done a coffee photo in awhile, so here’s my cuppa joe from today. It’s a locally roasted coffee that hubby and I got from the farmer’s market. Lunch was simply leftover spaghetti and foccacia from last night. 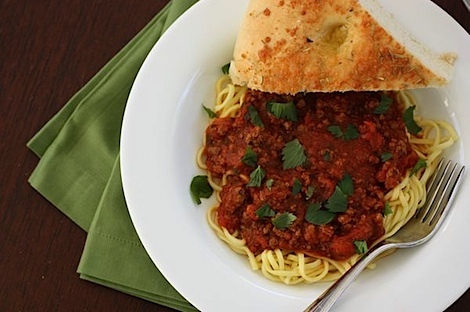 I love how spaghetti is pretty tasty the day-after. 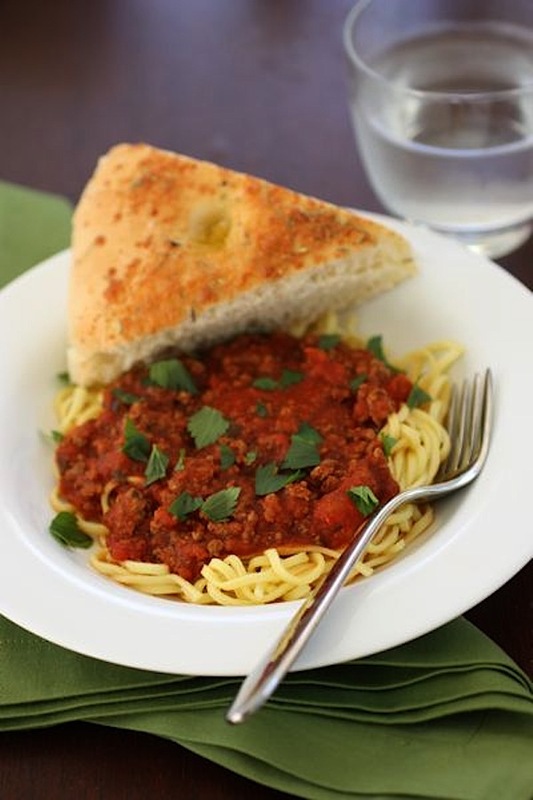 Re-heating fresh pasta tip: just drop the pasta into boiling water for 30-60 seconds till it’s warm again. It’s sooooo much better this way than using the microwave. I ended up taking a half day today. I was ready for my holiday to start. I’ll probably wish I had my half day still when it comes time for Christmas, but I was happy to take off from work around 1pm today and get into a more festive mood with some baking. 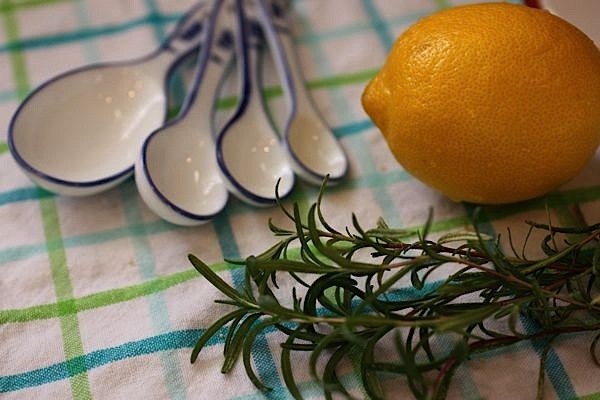 I had a really special project in the works – an original creation utilizing rosemary and lemon. The rosemary is actually from my herb garden. Woohoo! 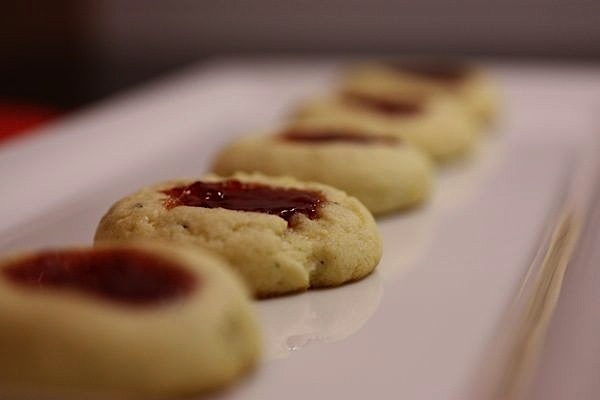 I decided to try a new flavor profile for thumbprint cookies. 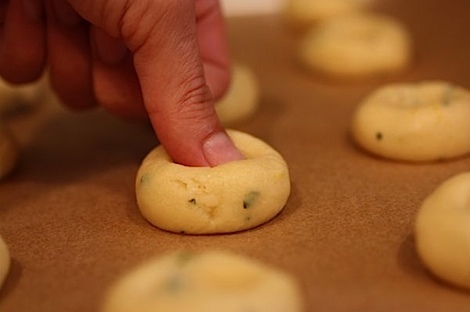 I started by rolling my chilled cookie dough into about 1-inch balls. 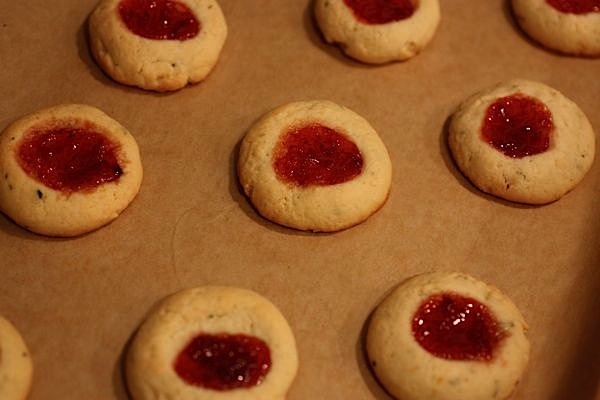 The last step before baking is to fill the cookies with strawberry preserves. I like the Bonne Maman brand, though I typically wait till it’s on sale to buy it. While my cookies baked, I got ready for the day and snapped a couple Bailey shots. Post-baking. These guys made my kitchen smell so divine! Much like the dough balls, they won’t really brown much on top. You can tell they’re done with they start to brown just so around the bottom edge of the cookie. The cookies were so darn good I ended up eating 4 of them after they came out of the oven (with a little time for cooling of course)! …but who cares, right? To me, these cookies are good any time. Pre-heat oven to 350 degrees F. Prepare baking sheets with parchment paper. In a large bowl, whisk together flour and salt. In a medium bowl, mix sugar and butter till creamy. (I used a handheld mixer, but you could probably just use a whisk). 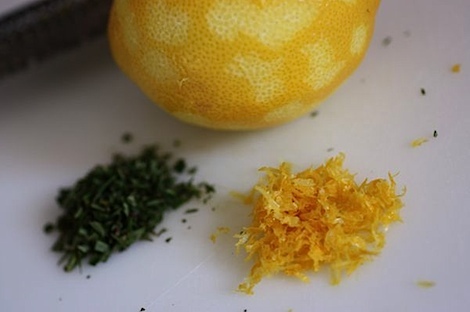 Add egg, rosemary, lemon zest, and lemon juice and mix till combined. Mix wet into the dry. Note: it may appear there is not enough liquid for the amount of dry ingredients, but continue mixing. It will form into a dough, it will just be a firm dough. See tips above for combining. Careful to not overmix. 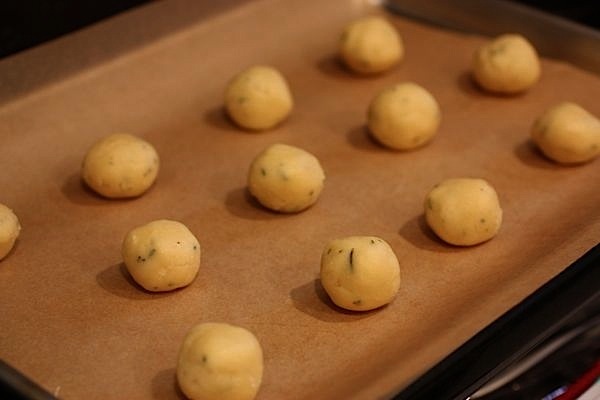 Refrigerate dough for at least 30 minutes before forming dough into 1-inch balls. Press your thumb into the top of the dough balls to form an indentation. Fill each indentation with 1/4 tsp of strawberry preserves. Note: Be careful to not cross-contaminate your preserves. 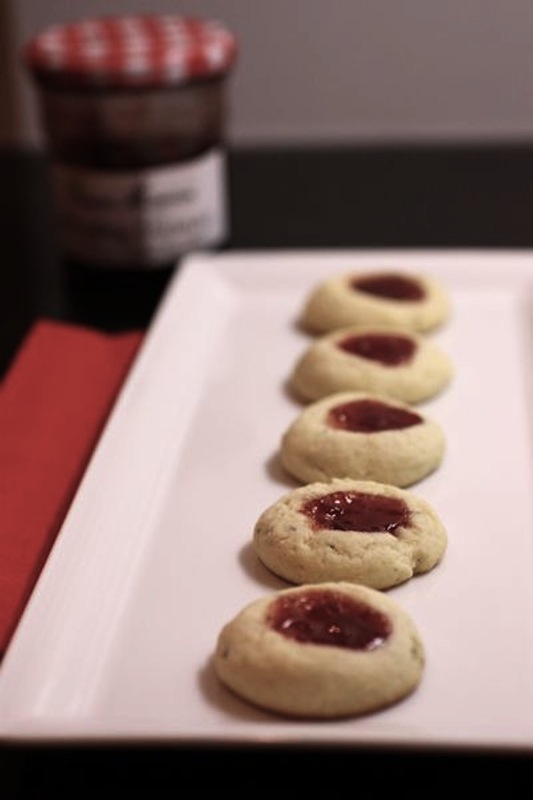 Don’t let the spoon you’re using to fill the cookies touch your preserves container. 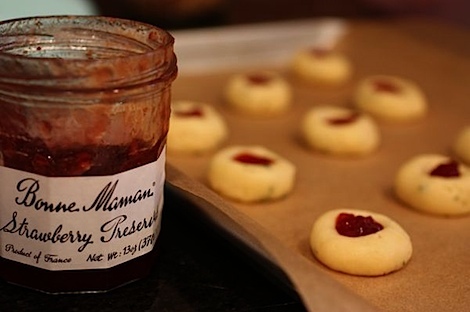 If you’re worried, move a small amount into a bowl separate from the preserves container. Bake balls for 13-17 minutes, depending on how soft or crunchy you want your cookies, plus to allow for differences in over temperatures. Note: The tops will not really brown, but the bottoms will. 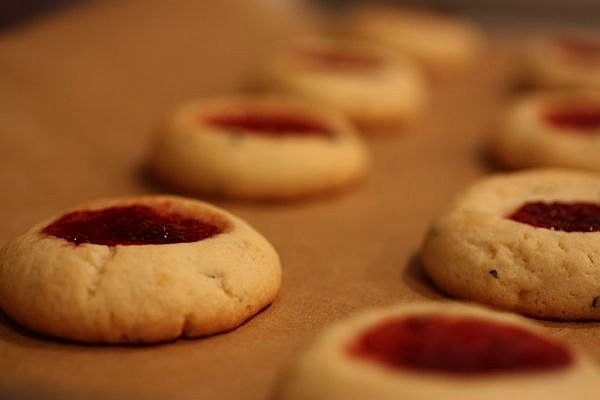 You can tell your cookies are done if the bottom edges start to brown. 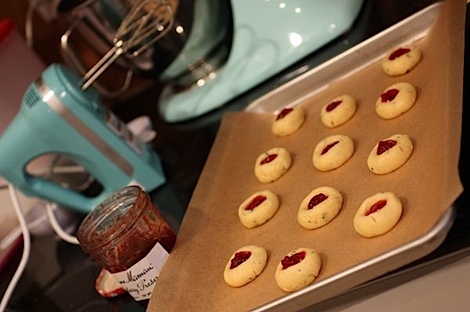 Let your thumbprint cookies rest on the baking sheet to cool at least 5-10 minutes. I actually also baked some butterscotch dough balls along with this new flavor to take to a Thanksgiving Eve party. 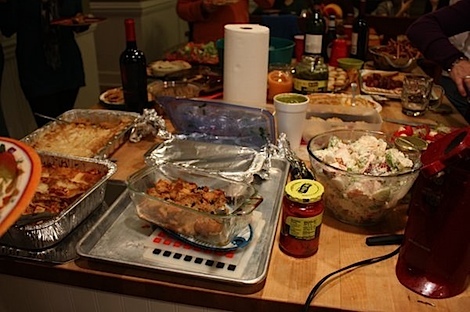 There was an insane amount of food at the party! I normally try to get a bit of everything, but there was just too much! I ended up with some pasta salad, ham, a tamale (love! ), cheesy baked potatoes, lasagna, and a roll. I was actually so full from the savory eats that I didn’t dig too far into the dessert table. I had a Caribbean coconut cookie and some thin Moravian-like cookies. Wishing everyone safe travels and fun times with your friends and family! 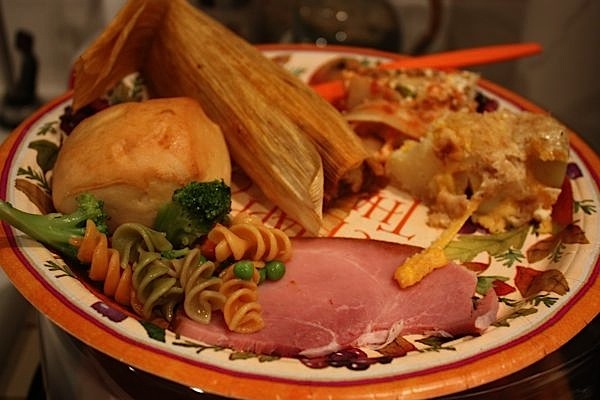 What food item are you MOST looking forward to on the Thanksgiving table? Oh, wowzers! Those cookies sound delightful. 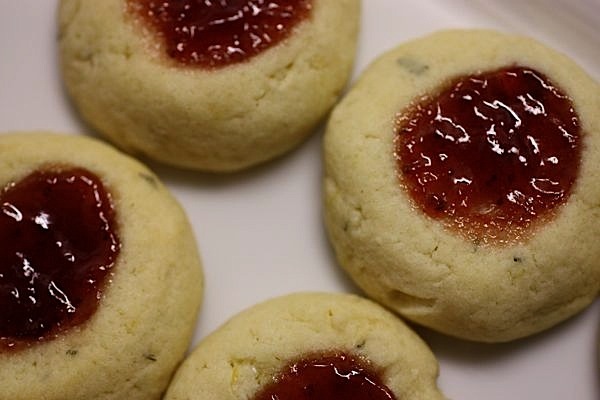 My mom has a great rosemary butter cookie – love them! I just have to say: LOVE the boots!! Happy Thanksgiving to you!! these look delicious! i knew they would turn out perfect! I love added lemon flavor- one my my favs! These cookies sound delicious! Such a good idea to add rosemary! Yum :). 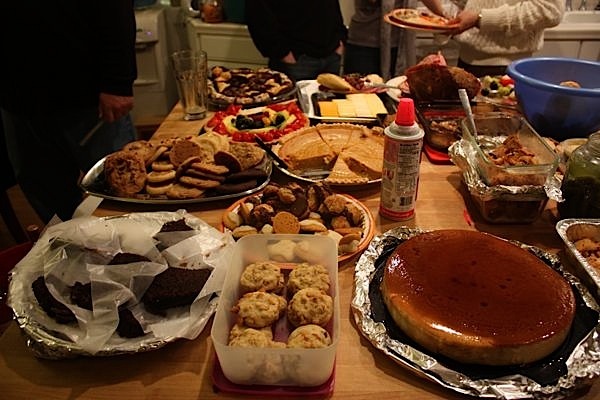 I would totally own that dessert table! Those cookies sound yummy! I might have to try those out this weekend. Instead of running around shopping, I’m going to spend the long weekend baking…and eating. 🙁 S’ok because I’m rejoining WW this next week, LOL. I’ve been out of control with all the Jeni’s ice cream I’ve been eating! Those butterscotch dough balls I made the other day? I ate ALL but one of them (at least, I think the hubs only had one). 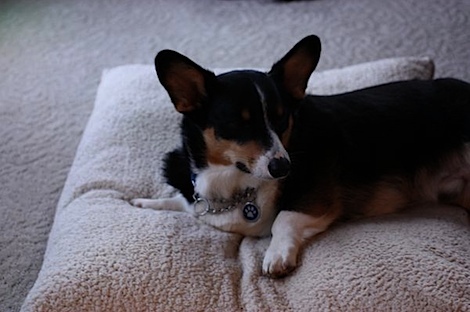 So, speaking of coffee…I just wanted to tell you that I LOVE the Don Pablo that I won on your blog a little while ago! SO tasty! 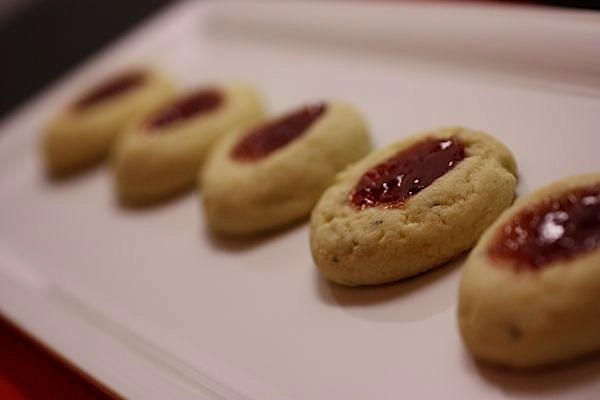 The cookies look very good – I never would have imagined to put rosemary in a cookie but I bet it’s very subtle and delicious. I’m most looking forward to the stuffing with veggie stock…every holiday event I’ve been to thus far I’ve been salivating over stuffing but have said no because I’m sure it’s made with chicken broth…which stinks cause it’s my absolute favorite T-giving food! And now that I’ve chatted your ear off…have a great Thanksgiving, Diana! Hooray! 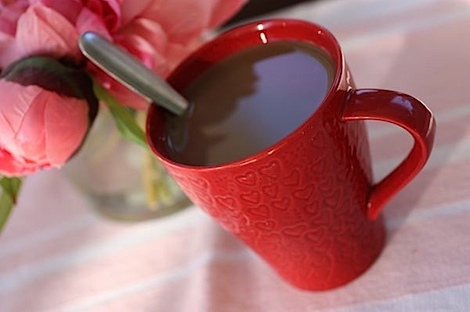 Glad to hear you liked the coffee! 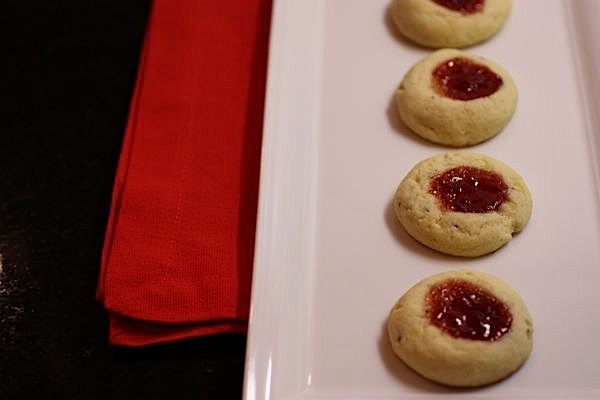 These looks great, D. I can not remember the last time I had or made thumbprint cookies. 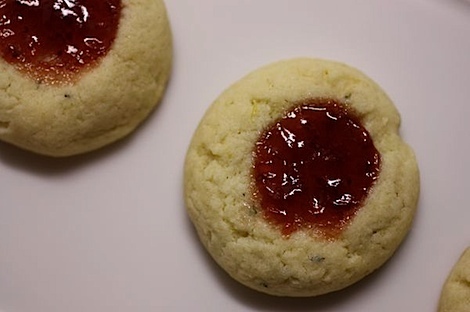 I might have to use your dough for the basis of my cookies, minus the rosemary, as I plan to put chocolate PB in place of the jam. THANK YOU for posting these cookies 🙂 I’ve never done thumbprint cookies before but that’s what I plan on making for my family’s annual cookie exchange. oh my – everything looks wonderful! Have a great day!! !